COPYRIGHT © 2008 Norm Bernstein All rights reserved. 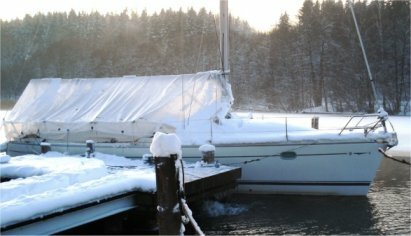 Several people relatively new to boating have asked me about the decommissioning process for their sailboats, and since it's that time of the year, I thought I'd contribute what I've learned over the past 23 years, in terms of how to put one's boat away for the winter. Some people depend on their marina or boatyard to do this; I prefer to do the work myself, thereby saving money and knowing confidently that it was done right. This advice is targeted at people who story their boats for the winter in climates that routinely freeze, so you Florida guys can ignore this! Up here in New England, I ordinarily stop sailing in early October, usually due to the press of business and family events, but I don't decommission the boat until early November, since I have a heating system and can still use the boat as a get-away during the week and on weekends. By the time November 1st comes along, I'm ready to put the boat to bed for the season. Here goes. We begin the process by pulling off the sails and folding them, storing them in their sailbags down below for the winter. Some people like to give them to sailmakers for `inspection and repairs', but I don't do this unless there's a specific problem. They're fine, sitting down below, over the winter. We remove the bimini and dodger, and fold them and store them below, to help to preserve them and extend their life (the winter snow and ice is hard on canvas!). We also remove whatever else is readily removable, such as the stern barbeque, man overboard system, etc., and store this stuff below. Since we have mainsail roller furling, I want to take special precautions to prevent the extrusion inside the mast from banging around... which is annoying, and probably not good for either the mast or the extrusion. There's a simple way to do this. I take the mainsail halyard, and run it around the extrusion seven or eight times, pulling downward as I go so that the halyard becomes a spiral around the extrusion. This cushions the extrusion and stops the banging. I also spiral the genoa halyard around the forestay extrusion, which dampens the vibrations caused by the wind somewhat. I usually start out by doing the standard engine maintenance, which includes changing the engine oil and filters, the engine-mounted fuel filter, and the Racor water separator filter. This doesn't have to be done for the sake of winterization, but I prefer to do this in the fall, so that the engine is filled with fresh oil for its 5 month `sleep'... and it's one less task to do in the spring, when I want to devote my energies to cleaning the boat after launch. This usually takes me about two hours or so. I start by warming the engine up, in gear; modern diesels are so efficient, they don't generate much heat unless there's a load on them, so I put it in reverse and let the two bow lines hold the boat to the dock, until the fan thermostat clicks on, which indicates that the engine is up to operating temperature. I then shut the engine off, and drain the engine oil using a simple 12 volt oil pump, via a 1/4" polyethylene tube shoved into the dipstick tube. It takes about 20 minutes or so to drain as much oil as possible. I then let the engine cool a bit while changing the fuel filters. I drain the Racor water separator filter via the plastic valve underneath (until a cut-down polyethylene jug), and then unscrew the filter just like an oil filter. The clear plastic bowl at the bottom unscrews from the filter body, and after cleaning, is screwed onto the new filter... then the filter assembly is screwed back onto the fitting. It's important to lubricate both seals with diesel fuel before screwing them back together, and it's especially important to NOT overtighten them... or you'll have the devil of the time getting them off, the next time. Once the filter is back in place, I unscrew the little white plastic knob at the top of the assembly, which is actually a priming pump; a few vigorous strokes fills the filter with diesel from the tank, after which, the pump handle is screwed back into the assembly. The engine-mount fuel filter is next; On my Yanmar “75HP turbo”, the filter has a fitting at the bottom which is actually a water sensor, and it needs to be disconnected and unscrewed first. It's very difficult to catch the contents of the filter as this fitting comes off, but I do the best I can, using lots of wadded up paper towel, to absorb the dripping (this whole process consumes two full rolls of paper towel!). Once the bottom fitting is off, I can unscrew the filter from the top fitting. Installation of the new filter simply reverses the process. Once the new filter is in place, it needs to be primed; I remove the bleed screw from the side near the top, and pump on the mushroom-shaped dome at the top (which is actually a priming pump) until diesel squirts out of the bleed screw hole. I then replace the bleed screw. Finally, it's time to replace the engine oil filter. Here, I use a trick: I take a Ziploc bag from the galley, and pull it over the horizontally-mounted filter before unscrewing it. The bag helps to catch most of the contents of the oil filter as it comes off... the inevitable drips are caught by lots of wadded-up paper towel shoved beneath the engine. The new filter's seal is lubricated with a bit of the oil, and is then screwed on... once again, it's important to NOT overtighten, or removal the next time may invoke a great deal of foul language! Once the filter is in place, I pour in 5 quarts of 15W-40 engine oil, and get ready to start the engine. It's normal for the low oil pressure alarm to sound for 10 seconds or so, until the filter is filled with oil. Then I run the engine for 30 seconds, shut it down, look for any leaks, and top up the oil until the dipstick shows it's full. The next task is to winterize the water system. The object is to insure that no fresh water is trapped anywhere in the water system, so that a freeze up (and the accompanying expansion) doesn't crack or break anything. Some folks do this by blowing out the lines with compressed air, but I think this is really the hard way to do it, and it's not completely effective; some water, as well as condensation, can collect in low spots and freeze up. Instead, I use the ubiquitous non-toxic antifreeze sold at West Marine. This stuff is cheap and safe. I buy a full case (6 gallon jugs), but different boats might require more, or less. The first task is to drain the water tanks as much as possible. (Don't forget to switch off the hot water heater!) We have three water tanks, and we use them sequentially, so I drain them by running the faucet nearest the valves (the sink in the aft head), draining each tank sequentially until the pump is obviously spitting air. I then pour one gallon of nontoxic antifreeze into each tank. At this point, I want to insure that the lines from each tank, to the water pressure pump, are filled, so I open up the valves of each tank, one at a time, and run the faucet in the head (using just the cold water side; more on this later) until I see pink stuff running out. When this is done, the next task is to insure that the cold water lines to each faucet in the boat are filled with antifreeze, so I open them one at a time, until I see pink stuff. There are four in my boat: the galley sink, the sinks in each head, and the shower on the stern. The hot water side needs slightly different treatment. You don't want to have to fill the hot water tank with anti-freeze in order to purge the hot water lines... in my boat that would take 11 gallons! There are two approaches to dealing with this. One approach is to install a hot water heater bypass. This is an arrangement of valves that permit you to cut off the pressure water feed into the hot water tank, bypassing it, instead, to the outlet of the hotwater tank. This would permit you to purge the hot water lines without having to put any anti-freeze into the hot water tank, itself. I take an alternative approach. I simply open the drain on the hot water tank, allowing it to be drained into the bilge and pumped overboard by the bilge pump. I then open up ALL the hot water faucets in the boat, which relieves the vacuum and allows those lines to drain by gravity back to the hot water tank, and thence into the bilge. This isn't perfect, because there may be water trapped in low spots in the piping... but as long as there's no constraint, the pipes won't split when it freezes. The bypass plumbing is a better arrangement, and I've even bought the fittings to do it.... I just haven't gotten around to installing it yet. Now, I can winterize the shower sumps, by pouring in 1/3 gallon of antifreeze into them, and operating the shower drain pumps. I remove the strainer covers for the winter. I winterize the heads by pouring a half gallon into each toilet, and operating the pumps (this presumes that the holding tanks were previously empty, by the way). Any water left in the inlets to the heads will drain out after the boat is hauled, and the seacocks opened. At this point, the water system is safe against freeze-ups. This is the final, and easiest, part of the process. In my boat, the raw water strainer is mounted will above the waterline, so I close the raw water thru-hull, and open the strainer. I start the engine, and pour two gallons of antifreeze into the strainer as the engine runs. An observer on deck can verify that the exhaust is pumping out pink stuff, and in my boat, the raw water lines are transparent, so it's easy to see that they've been filled with antifreeze. As soon as we've consumed two gallons, the engine is shut off, and won't be started again until the spring. If the strainer isn't above the waterline, the alternative procedure is to close the raw water through-hull, pull off the hose and stick it in a 2 gallon bucket of antifreeze, and run the engine until the bucket is drained. If you have water-cooled air conditioning, that must be winterized, as well. In my boat, the intake strainer for the A/C is about at the same level as the 120VAC circulation pump.... which is a good thing, because those pumps can't self-prime. I close the intake thru-hull, and open the strainer. As someone switches on the A/C, I pour a gallon of antifreeze into the strainer, which fills the condenser coils (and can be seen being pumped out). If the strainer were below the level of the pump, it would be hard to get the pump to prime. On a previous boat, I had to install some fittings to let me get the system primed. With a deck-stepped mast, my bilge is quite dry, so all I need to do is pour the remaining antifreeze into the bilge, and let the bilge pump work, which winterizes the pump and the lines. My boat has one minor problem; the bilge pump thru-hull is mounted high on the side of the boat, and rainwater can drip into the fitting and collect in the outlet hose and freeze. I solve this by building a little `hood' out of duct tape to insure that water can't drip into the fitting. If you have a keel-stepped mast, it's best to partially fill the bilge with antifreeze, and check it periodically through the winter, running the bilge pump if a lot of rainwater has made its way down the mast and into the bilge. This is one reason I'm so fond of deck- stepped masts! I've tried all sorts of systems, from simple blue poly tarps, to a custom-fitted Fairclough boat cover, to shrinkwrap... There are pros and cons to each of them. Blue poly tarps are common, but rarely successful; the marina employers contemptuously call this `welfare wrap'! The problem has to do with devising a decent frame to support the tarps, plus adequate tie-down. The prime reason these tarps fail is because they're not properly supported, and/or inadequately tied down. In the former case, they can trap snow and ice, and subsequently tear. In the latter case, inadequate tie-down can result in wind damage as the tarps flap around. UV exposure eventually destroys the material, so they have a short life span. Nonetheless, I've seen some impressive homebrew blue poly tarp systems, with frames fabricated from PVC or irrigation piping, etc. It is critically important to NOT tie any cover to the jackstands that support the boat… a strong gust of wind can literally pull the jackstand out from under it! If you're going to go this route, it's best to plan carefully and be sure that the tarp is well supported and adequately tied so the wind doesn't cause things to flap. Shrinkwrap is common, but I don't like it. It is absurdly expensive, usable one time only, and doesn't permit the interior to `breathe' (despite the pitiful vents installed), so condensation can be a problem. Nonetheless, it's pretty popular at my marina. A custom fitted cover, like those made by Fairclough, is a thing of beauty. I owned one of these, on my Catalina C400, and it was fabulous, fitting the boat perfectly. However, it was VERY expensive (I bought mine used, but a new one could cost $6000 or more), and requires a heavy galvanized steel frame system to support it, which is a pain to have to store when not being used. The two piece cover itself is VERY heavy... not a one man job to erect. My solution is a home-made canvas cover, which covers only the cockpit. We made it from the same Sunforger Boatshrunk canvas used by Fairclough, and sewed it on our home sewing machine. It drapes over the boom, and lashes to the perforated toe rail, with triangular end panels that enclose the cockpit completely. I've found that it isn't necessary, or even effective, to try to cover the entire boat; we cover the cockpit to preserve the laid teak cockpit sole, and to prevent any accumulation of snow and ice, which can expand and crack fiberglass, especially if the scuppers freeze. I hope this has been of help to anyone.